Water cutting accrues to the fast, precise and flexible implements of material processing. 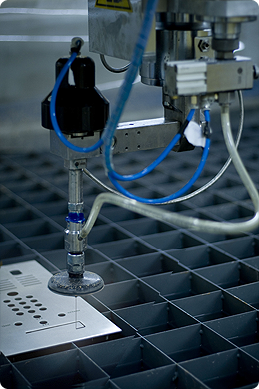 Waterjet cutting figures on using high pressure water stream, generated in pressure pomp, going through small perforation in order to focus the most amount of energy as possible at smallest area. With this stream it is possible to cut through various material. The abrasive increases productivity of water stream enabling us to operate very thick materials.